Nearly 2,000 years ago, Jesus started a movement that has grown like wildfire throughout history. Author and pastor Andy Stanley draws from Scripture and over 25 years of pastoral experience to bring to life the irresistible nature of this movement known as the Church. In Deep & Wide, Stanley identifies some of the key decisions and strategies behind the founding of North Point Community Church in 1995, describing how and why it continues to flourish. He also shares stories of how God is working today to propel the movement of the church through the six locations of North Point Community Church in Atlanta, GA and the 25 strategic partners throughout North America. He illustrates how to create a ministry that appeals to many--casting its net wide--while helping people mature into a lifelong relationship with Jesus--leading them to a deeply-rooted faith. If you want to know how you can create a movement in your local community that can make a lasting impact, Stanley points the way by redefining terms, resisting gravity, establishing five faith catalysts, creating irresistible environments and establishing critical rules of engagement within your church. 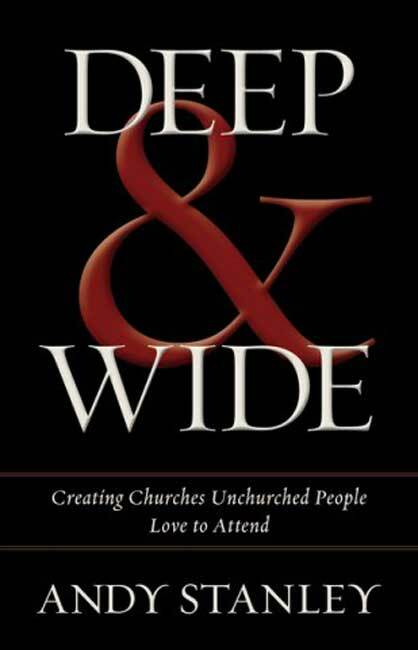 Deep and Wide by Andy Stanley was published by Zondervan in March 2014 and is our 13679th best seller. The ISBN for Deep and Wide is 9780310493075. Be the first to review Deep and Wide! Got a question? No problem! Just click here to ask us about Deep and Wide.